This is a trip for the serious sportsman! You will get the opportunity of reeling in fall run chinook salmon, coho salmon, steelhead, rainbow trout, and cutthroat trout as well as blasting ducks and geese out of the sky. The blast and cast is a combo trip where you will be armed with a shotgun as we travel down river fishing. There are always great opportunities to blast ducks and geese on these down river trips. Duck and goose season in the southwest zone is October 11th thru the 26th, October 29th thru January 25th. Last year there was an early goose season from September 6th thru the 15th. It made for some great hunting, but I'm not sure it will be a yearly thing. 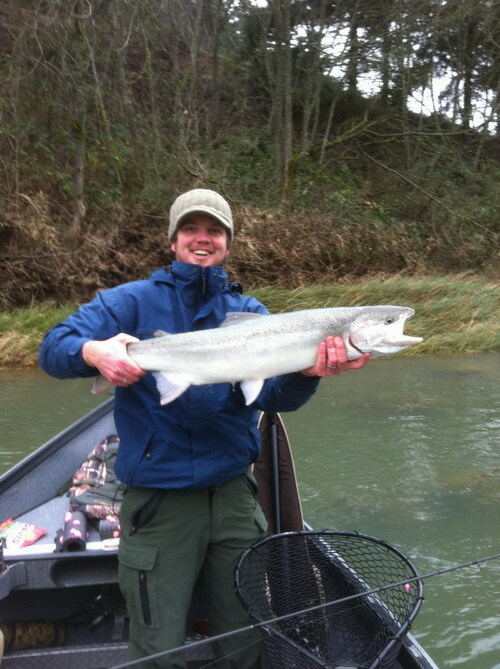 During this time of year there is fall salmon fishing as well as steelhead and trout in the river. The blast & cast trip includes top of the line fishing gear, tackle, bait, drinks, snacks, thermos full of hot coffee, comfortable seats with arm rests, and a heater for those cool days. You will want to bring a sack lunch or we can provide a deli style lunch for an additional fee. BLAST & CAST - $250 per person for 2 or more people.